Sign-up for a free trial. You will also get to try out ArcGIS for Desktop, which includes ArcGIS Pro, and apps such as Explorer for ArcGIS, Collector for ArcGIS, Operations Dashboard for ArcGIS, and Esri Maps for Office. Plus you get to invite up to four other colleagues to the trial, so you all can see how easy it is to make maps and share content. Sign up today. Visually explore how colors and sizing visually affect the data using the histogram and ramp. Esri strives to help you make visually stunning and useful maps, quickly and confidently. That's why a capability called Smart Mapping was recently added to ArcGIS Online. Enhancements to the ArcGIS Online map viewer offer new ways to symbolize data, provide smart defaults, and support data-driven workflows. Continuous color ramps and proportional symbols, improved categorical mapping, heat maps, and new kinds of bivariate maps using transparency are delivered via a streamlined and updated user interface. Smart Mapping gives you more than an easier way to make new types of maps. Concepts and techniques used by professional cartographers are programmed into ArcGIS Online as a set of interconnected smart defaults that create data-driven workflows and take the design to a higher level. Unlike software defaults that are the same every time, smart defaults offer the right choices for the data you are working with. 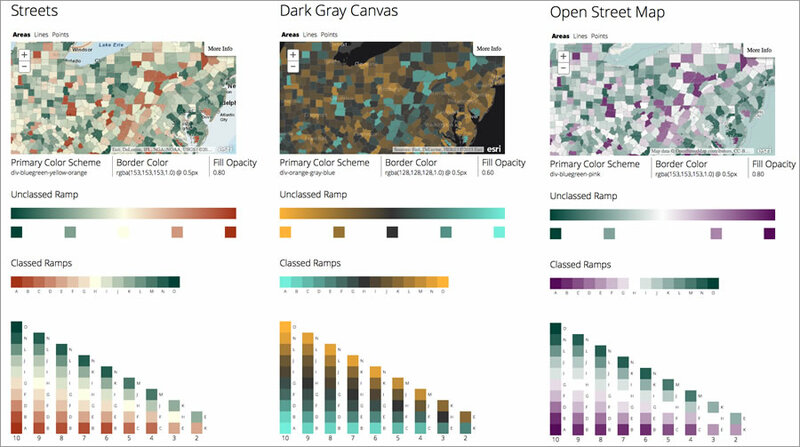 Smart Mapping takes the guesswork out of choosing the right color ramp that works best for your data. 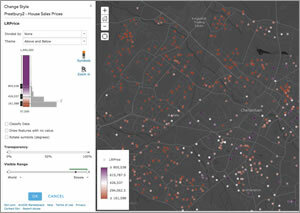 ArcGIS analyzes data in the map viewer quickly and in a variety of ways to display mapping choices driven by the data in the map, the kind of map you want to create, and the kind of story you want to tell. For example, if you want to make a map that shows how place relates to target values (for example, whether they are above or below the national average), Smart Mapping makes this easy. Esri's goal is to take the guesswork out of the hundreds of available settings and choices so your maps are both cartographically correct and professional looking. Even if you don't have a degree in cartography or GIS, you will be successful. This also means you can work much faster because you spend less time iterating versions of your maps. Smart Mapping does not take control away from map authors or dumb down the map authoring experience. It just offers smarter initial settings for the map including color, scale, and styling. Mapping pros still have full control over map creation. Esri simply improved the process and removed defaults that provide the wrong choices for your data and story. Whenever possible, Esri has embraced a live styling philosophy so you can see the changes you're making instantly on-screen. Design is visual, so authoring tools should provide visual feedback. That's why Smart Mapping benefits both novices and experts, making everyone more productive.